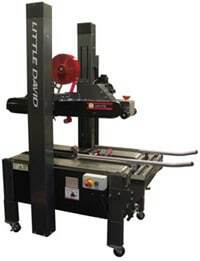 The Little David® LDX-UTB is one of the newer additions to the high performance, industrial grade case sealers from Little David®. 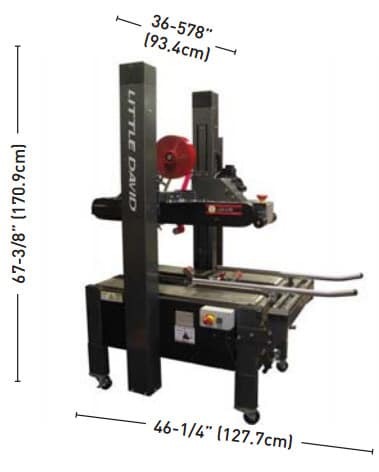 Constructed of fully welded tubular steel, this top and bottom drive case sealer is optimal for sealing large runs of the same case size at high speeds. Its speed, extensive case range, and instant case changeover with self-centering side rails set it apart from competing machines. This case sealer can process cases 20%-80% faster than the competition, giving you the efficiency you need. Welded tubular steel construction, reinforced critical stress points and lightweight removable access panels. Self-centering side rails and adjustable top drives, including movable magnetic control station with start/e-stop button and interchangeable top and bottom tape cartridge. There’s easy access to all the motors, electrics, and belts for quick and easy maintenance or repairs.